The TARDBP gene encodes the TDP-43 protein, initially found to repress HIV-1 transcription by binding TAR DNA. TDP-43 has since been shown to bind RNA as well as DNA, and have multiple functions in transcriptional repression, translational regulation and pre-mRNA splicing. For instance, it is reported to regulate alternate splicing of the CTFR gene. In 2006 Neumann et al. found that hyperphosphorylated, ubiquitinated and/or cleaved forms of TDP-43, collectively known as pathological TDP-43, play a major role in the disease mechanisms of ubiquitin-positive, tau- and alpha-synuclein-negative frontotemporal dementia (FTLD-U) and in amyotrophic lateral sclerosis (ALS). Various forms of TDP-43 exist, including 18-35 kDa of cleaved C-terminal fragments, 45-50 kDa phospho-protein, 55 kDa glycosylated form, 75 kDa hyperphosphorylated form, and 90-300 kDa cross-linked form. (PMID: 17023659,19823856, 21666678, 22193176). 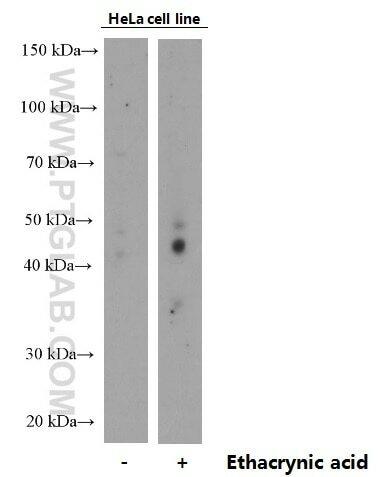 66318-1-Ig is a phospho-dependent monoclonal antibody specifically recognizing phospho-TDP43 (409/410). It does not react with native TDP-43. The N-termini of TAR DNA-binding protein-43 (TDP43) C-terminal fragments influence degradation, aggregation propensity and morphology.